Newer technologies will increase samples, improve data collection and save farmers money. Soil analysis is is on the edge of a paradigm shift, and the ag retailer or crop consultant who doesn’t make t he jump may be left behind One look at the problems and opportunities facing crop producers, and it is clear the shift can’t come soon enough. The Des Moines Water Works lawsuit over nitrates, regulatory concern over phosphorus (P) in Lake Erie and other waters and grower efforts to fine-tune inputs are all indicators that change needs to happen. Elliott also pointed to how quickly today’s new products can manipulate soils and plant chemistry. He warns that if you’re not watching changes occurring in the soil, you can run into problems that will set the field back as much as five years. 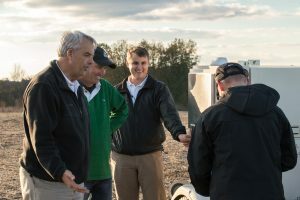 He noted that growers are intensifying management more than ever before and employing precision technologies with sub-inch accuracy. Meanwhile, the industry and growers continue to rely on soil sampling technology more than half a century old and soils data nearly that old.